There are various ways tourists can travel to Tioman Island and the most popular being taking a ferry ride from Mersing to Pulau Tioman. At the moment, it is the only way to travel to the Island as the air flights have been suspended. There are many ferry services operating in Mersing, that takes passengers to and from Mersing to Tioman Island. One of the recommended ferry service is Blue Water Ferry Tioman. The Blue Water Ferry Tioman Island is the only ferry renowned for its best service to its customers on the ferry trip mainly to Pulau Tioman. It is considered to be the most reliable and affordable ferry ride feasible for its enormous tourists and its local customers as well. For instance, the single i.e. one-way trip by blue water ferry cost only 40.25 Ringgits for an adult and for a child the standard rates are 34.50 Ringgits especially. Blue water ferry ride from Mersing to Tioman Island takes its passengers on a ferry ride sharp in the morning as early as 07:30 am and reaches the destination point i.e. Tekek Village stop within two hours approximately. The ferry service is not 24 hours so the last departure of ferry from Mersing to Tioman Island will be before 5 pm. For the ease of tourists, you can now book ferry ticket online from Mersing to Tioman. Follow the step by step guide below to book your ferry ticket online and get an instant confirmation of your booking. Step 1: Open the Ferry booking site by clicking here. Step 2: Click on Ferry Ticket tab. 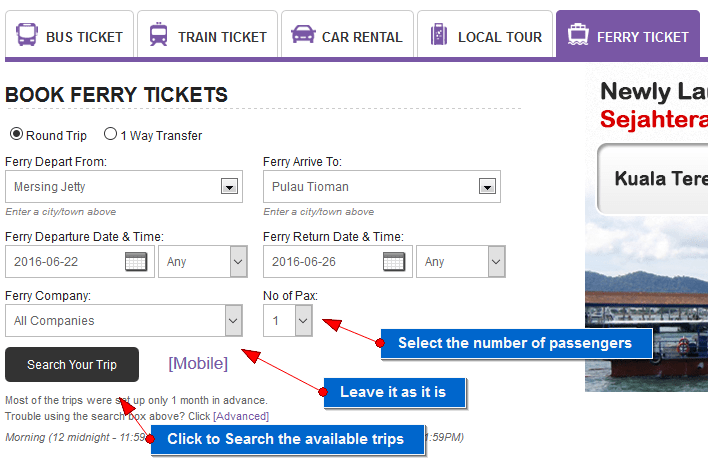 Step 3: On “Book Ferry Tickets” page, select type of trip, i.e.., Round Trip or 1 Way Transfer. If you have a confirmed itinerary then we’ll recommend to book a “Round Trip” ferry ticket. 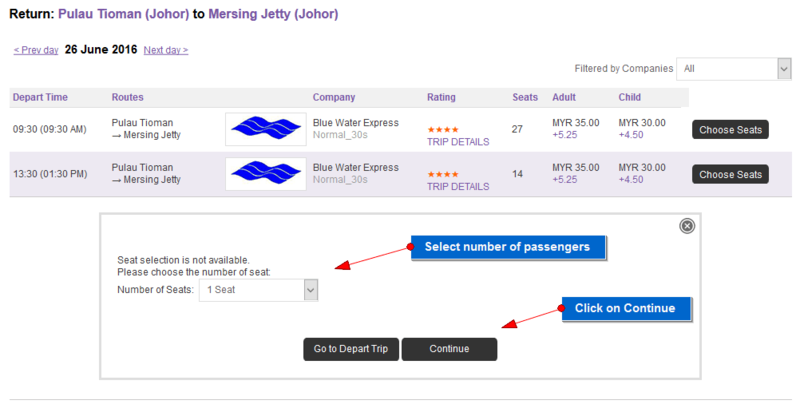 Step 4: In “Ferry Depart From”, type “mersing” and then select “Mersing Jetty” from the drop down box. 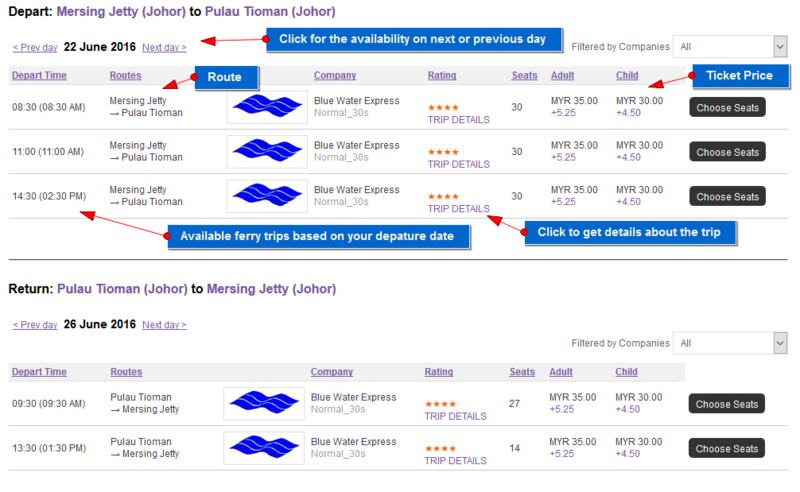 Step 5: In “Ferry Arrive To”, click on the drop down box & select “Pulau Tioman”. 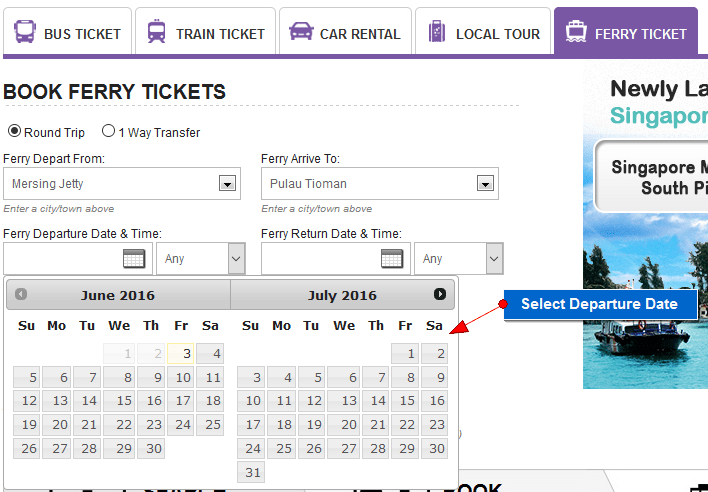 Step 6: In Ferry Departure Date & Time, click and select the preferred traveling dates. The drop down box beside the calendar lets you pick the time as well. The time is not specific but rather generic like Morning, Afternoon, & Evening. You can leave it to “Any” to get the maximum results based on your departure date. 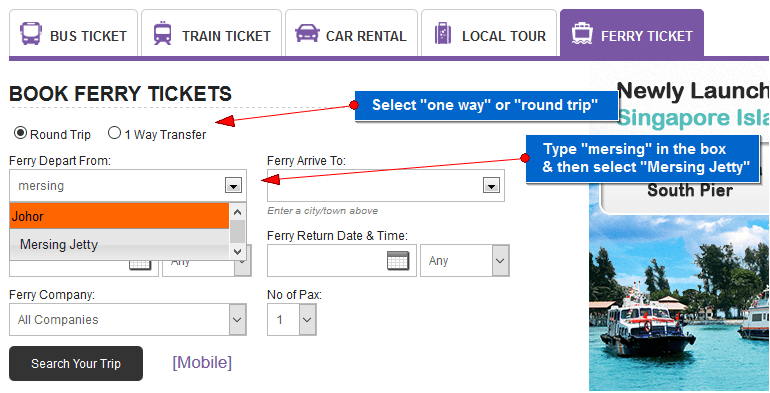 If you’ve selected “Round Trip” option for your trip, you will see “Ferry Return Date & Time”. Select your return date as well. Step 7: Leave the “Ferry Company” to default, i.e.., All Companies. Select the number of passengers & click on “Search Your Trip” button. Step 8: On the next page, you will see availability of the trips, based on your departure & return dates. You can get more information about the trip by clicking on “Trip Details”. 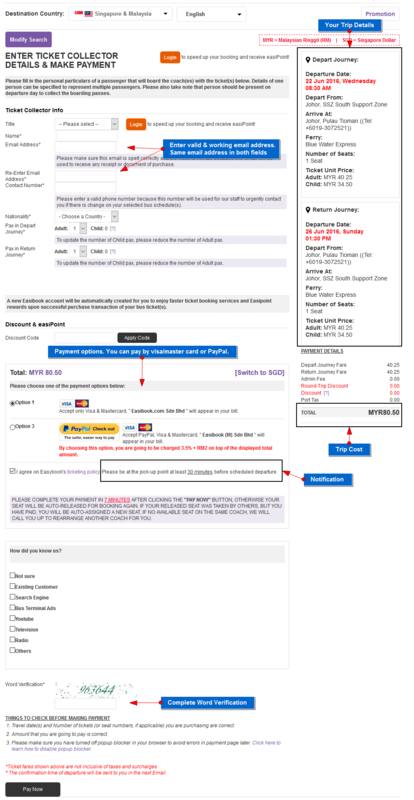 You can also see the ticket price & route detail on this page. Step 9: Click on “Choose Seats” and beside “Number of Seats” drop down box, select number of traveling passengers. 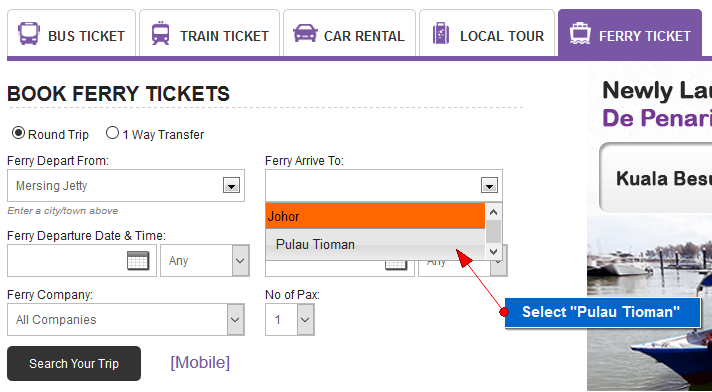 If you’re on a a one way trip, click on “Continue” button & if you’re booking a return trip, click on “Go to Return Trip”. 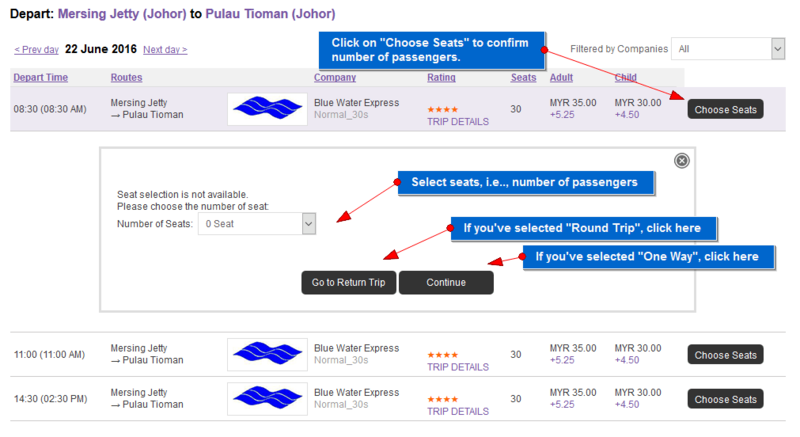 Step 10: For those on a return trip, click on “Choose Seats” based on your preferred return date. Select the number of passengers & click on “Continue” button. If you want to review your departure dates, you can click on “Go to Depart Trip”. Review your trip details to confirm the date & time. In the Email Address & Re-Enter Email address field, please use the same email address. Make sure the email address is valid to receive confirmation of your trip. You can directly pay by credit card or PayPal. The PayPal payment will incur additional charges, i.e.., 3.5% + RM2. Complete the word verification process at the bottom. Once completed, click on “Pay Now” button to proceed to the payment page. You will receive a notification to accept terms & conditions so just click on “Ok”. Once, your payment has been processed, you will get confirmation of your ticket. You will be able to print the ferry ticket as well. The most simple and fastest way to travel by ferry is a blue water ferry service to Tioman Island from Mersing. It is simple because of its all time availability been observed by most of the passengers who wanted to travel to Pulau Tioman by ferry as its monopoly over the other ferry services has made it special for the journey. The booking of blue water ferry should be reserved at prior through online facility from Mersing in order to overcome traveling delays and cost saving methodology simultaneously. Such as, people mostly found this service affordable as compared to other ferry services to Tioman Island. Its major booking facility is available at Mersing counter specifically. We can easily get the blue water ferry ticket from the counter here at Mersing specifically. The blue water ferry ticket is primarily famous for its authenticity. For instance, there are various visitors who prefer travelling through blue water ferry only because of its authentic tickets availability. People and tourists specifically who are eager to explore the feasible trip to Tioman by ferry also prefer blue water because of its reliable trip facility being provided to its passengers whose major concern is to enjoy each and every spot on the Tioman Island. The tourists are also capable to reserve the blue water ferry ride while departing from the Tioman Island. Such as, it mainly depends on tourists to reserve online an identical ferry in advance for its trip back to Mersing from Tioman Island. The cost of the blue water ferry can be done through various paying facilities. Such as, through numerous credit cards as well that includes Visa or Master cards in particular. The journey taken on board from blue water ferry service is termed to be fast and reliable. By grabbing the service of blue water ferry we can explore the beautiful spots on the way like Genting, Paya, Tekek, ABC, Panuba and Salang jetties as well. Blue water ferry also provides special promotional services like reserving of rooms in Berjaya Tioman Resort. For instance, if we can take a trip to the blue water ferry from Mersing and back to Mersing after enjoying the pleasurable trip and night stay in its special resort situated in Tioman Island. If you have experience a ride in blue water ferry Tioman and would like to share your experience, please do so by adding comments below. To know more about the activities you can do, please check out things to do in Tioman Island. If you’re traveling to Tioman Island from Kuala Lumpur, Singapore or Johor Bahru, you can checkout below articles, which will guide you ways to travel by bus to Mersing. From there, you can book Blue Water Ferry to reach Tioman Island.